Downtown San Mateo as previously discussed is one of the most difficult bottlenecks on the peninsula corridor, with some of the narrowest right of way anywhere on the peninsula (see mini map at right, extracted from Milepost 17 map). The following is an expanded discussion of horizontal alignment options in the downtown area. Assuming one needs to build four tracks through this area (an assumption we will later revisit), the inescapable mathematics of right of way width and track clearances dictates that the railroad will expand significantly beyond its current boundaries. The figure below shows a cross-section elevation at Third Avenue looking "north". The building on the left is the cinema, built partially on former railroad right-of-way and completed in 2003. To the right is Railroad Avenue, providing access to several blocks of downtown business frontage. Railroad Ave becomes a residential street north of the train depot. The cinema, along with other recently built projects such as the Main Street Parking Garage and the new train depot, have greatly restricted horizontal alignment options for the railroad. While they would only cost a few million to tear down and redevelop, these buildings are the source of considerable civic pride, so it is likely that the city will bend over backwards to preserve them--potentially at many millions of dollars of additional cost to the high speed rail project, and possibly with additional impact to residences in North Central San Mateo. Such is the sad reality of cost-benefit analysis when other people's money is involved. The figure below shows the city's preferred vertical alignment, with the tracks relocated below grade in a four-track trench, with side clearances appropriate for safe 125 mph (200 km/h) operation. The avenues would cross the tracks on bridges. As is readily observable, a four-track trench (the narrowest possible below-grade solution) could not be built without impacting structures on one side or the other of the right of way. Constructing the side walls of the trench would require even greater clearances than shown, approximately 110 feet by the city's own estimates--to accommodate wall tie-backs as well as temporary tracks to keep Caltrain operating during construction. More importantly, the trench obliterates Railroad Avenue, the only access to several businesses and residences. Those would have to be acquired under eminent domain. An outright tunnel would allow continued access to Railroad Avenue, along with exciting new land uses on top of the tunnel. However, a tunnel isn't just a trench with a lid: it requires a vertical divider for fire safety and to support the roof, which further increases the side clearances. (The reasoning behind the resulting dimensions was discussed in the Joy of Tunnels.) Building an underground station would consume even more space for platforms, stairs, escalators and elevators, as will be shown later. The figure below shows how a tunnel compares to the available space: it simply won't fit without causing even greater impact than a trench. About the only option that is possible to construct (a) without "taking" several buildings and (b) without permanently removing Railroad Avenue and its frontage is an elevated viaduct. The diagram below shows what such an elevated might look like. It could be built in halves, in order to keep Caltrain operating during construction. While an adorable little sketch by city staff (reproduced at right) shows a single concrete column supporting the entire four-track bridge deck, it is likely that seismic codes and the requirement to support massive freight trains would lead to four rows of columns, placed directly under each track. Parking is probably the only reasonable use for the concrete forest resulting underneath. The ambiance would be just like other parking garages in downtown--and might even replace other parking structures entirely, freeing up those locations for redevelopment. Driveway access to Railroad Ave businesses could be preserved. The elevated option is also likely to be far cheaper to build than a trench or tunnel: it involves about the same amount of concrete, but far less earth moving or road closure logistics. Furthermore, an elevated does not require the permanent closure of several residential cross-streets north of downtown, as contemplated in Focus on San Mateo. Despite the visual blight and noise, look for this alternative to be ultimately favored by the California High Speed Rail Authority... and possibly also by the city, once all the trade-offs are fully understood. While the elevated may not be a desirable solution, on the whole it may be the best solution. The foregoing musings do not take into account the configuration of the downtown San Mateo train station. By far the most important consideration is the location of Caltrain platforms--both their location with respect to the tracks (outside platforms vs. island platform), as well as their location along the tracks. Recall that the new depot was squirreled away to the north of First Avenue, on the outskirts of downtown, to minimize the impact of lowered grade crossing gates on rush hour traffic. 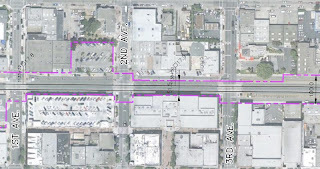 If the tracks are grade-separated and grade crossings are eliminated, this concern evaporates, enabling some options for a more centrally located station closer to 3rd and 4th Avenues, which form the main east-west artery of downtown San Mateo. Such central locations would be far more accessible for both pedestrians and motorists. In a four-track scenario, the resulting station widths are shown in the diagram below, not including the width of any ramps, stairs or escalators that might be required to access the platforms. These widths bear a direct relationship to the horizontal alignment of the tracks, since the station will be constrained on at least one side by existing structures. The island platform requires about 6 feet more width than the outside platforms, and the tracks sit 23 feet further apart. The CHSRA might use this as an excuse not to implement island platforms, despite their significant operational advantages. A below-grade station would be built in a trench, with 1st Avenue on an overpass. 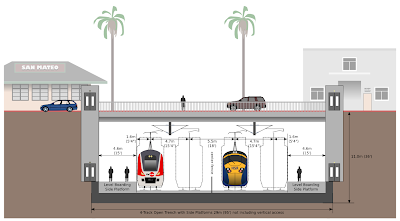 For all the talk about San Francisco's Transbay "train box", San Mateo's very own train box would be nothing to sneeze at, as readily observed in the following diagram. To reduce property impacts along the narrow right of way in the North Central neighborhood, immediately to the north, such that residences do not have their driveway under an elevated. Two of the most interesting three-track configuration options are shown in the figure below (linked to annotated PDF file), as designed by Richard Mlynarik. Both assume an elevated, for the reasons described above, and stay confined to the existing right of way between Monte Diablo Ave and the San Mateo Creek to reduce impact to residences along those blocks. There may be more design options with three tracks, but these two convey what is possible. Option 1 is a three-track station with outside platforms. This can be built either just north of the parking garage and cinema, at the existing location of the San Mateo station, or just south of the offending buildings. The southbound track skirts the cinema as tightly as possible. The northbound platform is built over Railroad Ave, which complicates access by ramps, stairs, escalators or elevators. Railroad Ave would have to be shifted underneath the elevated to free up room under the platform, and station access might interfere with business frontage. Option 2 is a better three-track station with a central island platform built over Third and Fourth Avenues. The same layout from the PDF file is overlaid on an aerial photo below. The central island platform enjoys easier access from below, since stairs and elevators would have ample space to touch down under the elevated, with direct pedestrian access from both sidewalks of 3rd and 4th Avenues. It doesn't have to be an oppressive structure: it could look like this amazing photo of Amsterdam's Bijlmer station, a model of pedestrian access. The difficulties in downtown San Mateo will be great, but so is the potential for an elegant solution that better integrates the station with the city. The city of San Mateo was incorporated in 1894, 30 years after the railroad began operating. Along the 4.5 miles of rail through the city, there are today three Caltrain stations, two of which (Hillsdale and San Mateo) are Baby Bullet stops. The three stations in San Mateo generate greater combined Caltrain ridership than San Jose, a city with ten times San Mateo's population. San Mateo is among the most treacherous areas on the peninsula to expand to four tracks for high speed rail because the existing Caltrain tracks run through dense residential neighborhoods and downtown blocks where the available right of way width is significantly less than 100 feet. The city is a "ground zero" of future grade separations: it is home to one-fifth of the grade crossings on the entire peninsula rail corridor (9 out of 46). To improve safety and traffic circulation, the city has long had plans to grade-separate all of its rail crossings; high speed rail will only hasten this process. The San Mateo County Transportation Authority has been carrying out a series of preliminary grade separation footprint studies in support of these plans. San Mateo finalized a Rail Corridor Transit-Oriented Development Plan in April 2008, covering the vicinity of the Hillsdale and Hayward Park Caltrain stations and including the re-development of the Bay Meadows racetrack site. 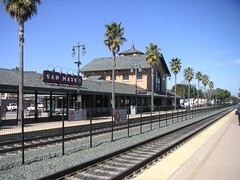 The San Mateo Caltrain station was rebuilt in 1999-2000 to alleviate auto traffic congestion. The new $11 million station with underground parking (photo above by ibison4) replaced a sparse older station a few blocks to the south. Every time a train stopped at the old station's center boarding platform between 3rd and 4th Avenues, auto traffic on 2nd through 5th Avenues was paralyzed, exacerbating rush hour congestion. With some foresight, albeit a bit fuzzy, the new station's underground garage and surrounding structures were reportedly built so as to allow the tracks to be relocated underground. This would not only grade-separate the tracks through town, but also accommodate a future BART subway, as was envisioned in the late 1990s while construction of the SFO extension was underway. The problem is now this: the new station building and underground parking encroach on the railroad right of way and do not leave the necessary clearance for four tracks, as likely required for Caltrain and HSR, whether at, above, or below grade. Worse, a couple of blocks south of the station, San Mateo's new downtown cinema and Main Street parking garage were completed in 2003 and encroach on what was once railroad right of way, leaving just 50 - 60 feet for the tracks (see Caltrain right of way map). The underground alignment presents significant technical complications, with residential property impacts just north of downtown where the tracks would ramp down, possible street closures, as well as the technical difficulty of crossing San Mateo Creek underground. While no decisions have yet been made, and despite the city's stated preference for a depressed alignment, the elevated alignment may present the least physical impact to property adjoining the tracks, although the visual impacts are worst. The city is considering options to mitigate the Berlin Wall effect, including building the track on a viaduct instead of retained fill. Contrary to San Mateo's official preference, the California High Speed Rail Authority shows an elevated track profile with 15-foot embankments through San Mateo in their program EIR/EIS; this may or may not be the preferred alternative once they complete the project EIR/EIS. The issue of track alignment through downtown San Mateo is discussed in much greater detail in Threading the San Mateo Narrows. 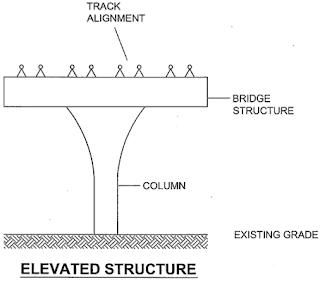 That discussion includes diagrams showing various track configuration options such as the elevated shown below. For more details, read all about Threading the San Mateo Narrows. North of downtown, the tracks curve through dense residential blocks on right of way that ranges from 60 to 90 feet wide, less than the ~75 feet required to run four tracks on a retained embankment, and certainly less than the ~110 feet required to excavate a trench or tunnel. The tracks cross four residential streets (Poplar, Santa Inez, Monte Diablo and Tilton avenues) on low-clearance bridges that have long been slated for refurbishment. The key question for downtown and the North Central neighborhood will concern the vertical alignment of the tracks. The close proximity of these residential blocks to downtown, combined with the gentle track gradients required for freight trains (yes, freight trains), will require that these areas be considered as one. The vertical profile of the existing tracks in San Mateo is shown in the figure below. This figure was created from Caltrain track survey data, with the vertical scale greatly exaggerated. The grade level of cross streets is estimated from the known vertical clearance at each location; the level of creeks is likewise estimated. Tracks are elevated at Peninsula Ave., an area with adequate clearances and commercial frontage that would favor this minimum-cost solution. Scenario #1: track elevated throughout. With a 1% gradient limit and a 10 kilometer vertical radius constraint, this is what San Mateo would look like. We assume each road is depressed by 5 feet (something that can be done with little impact to adjoining frontage), with the rails raised by 15 feet. It is likely that a viaduct structure would replace the existing embankments, possibly making room for a rebuilt Railroad Ave. All vehicle height restrictions in North Central would be removed. Worth noting, the elevated alternative does not require the closure of any crossings, unlike depressed alternatives. Scenario #2: trench through downtown. To shorten the sloping approaches and reduce the depth of the trench, we assume each road is raised by 5 feet (something that can be done with little impact to adjoining frontage), with rails depressed by 25 feet. Even this 25-foot trench penetrates below the water table and will require constant pumping to keep dry. With the 1% gradient limit desirable for freight trains, this design would require the closure of Villa Terrace, Bellevue, Poplar, Santa Inez, Monte Diablo and Tilton avenues, unless those streets were either raised or depressed with considerable impact to frontage on either side of the tracks. Scenario #3: trench through downtown, with steep approaches. With a less stringent gradient limit just a shade over 2%, difficult for freight trains but easily handled by high speed trains and Caltrain, the approaches to the trench are much shorter. This allows underpasses at Villa Terrace, Bellevue and Poplar and reduces the need to close cross-streets. Santa Inez, Monte Diablo and Tilton would likely still be closed. Scenario #4: tunnels. While this alternative will no doubt be studied by the CHSRA, it is unlikely to be implemented due to a host of disadvantages, not the least of which is the astronomical cost. The sloping approaches to a tunnel diving under downtown are likely to present even greater interference with cross-streets than the depressed trenches described above. Whatever alternative is ultimately favored, one must keep in mind that the biggest constraints on the vertical alignment of the tracks come from freight trains, which don't handle steep grades well and require very high vertical clearances. 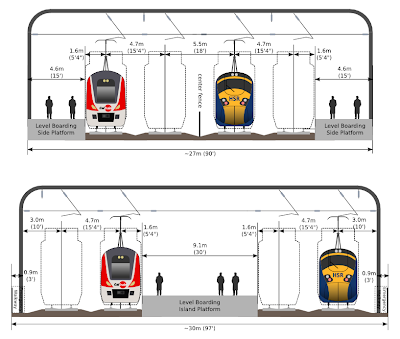 The more nimble electric trains used by HSR and Caltrain would easily handle steep gradients up to 2.5%, and would require about 3 feet less vertical clearance. In short, freight trains may have a direct impact on San Mateo neighborhoods. The southern half of San Mateo is an area currently slated for extensive re-development. It does not have nearly as much access across the tracks as northern San Mateo, and the available right of way is far less constrained, generally greater than 100 feet (see maps for mileposts 18, 19 and 20). The area encompassing the Hayward Park and Hillsdale Caltrain stations (and the former Bay Meadows race track) is slated for redevelopment as described in San Mateo's Rail Corridor Transit-Oriented Development Plan. Hayward Park includes a reverse curve in the tracks (curving right, then left). The northern curve at milepost 18.8 has a radius of just 1100 meters, good for about 95 mph. This curve made #5 on our list of Top Ten Worst Curves on the peninsula. While it was already flattened by shifting the tracks 20 feet westwards in the year 2000, this curve may need to be straightened some more so that high speed trains don't need to slow down as much in this area. This may not please residents of South Boulevard. The Hayward Park Caltrain station was rebuilt in 2000 and moved slightly to the south of its former location. The original station provided convenient pedestrian access across the tracks at 16th Ave; the City is now considering a new pedestrian underpass at this location to restore the access that was lost after the move. The new Hayward Park station was built for three tracks, although it currently has only two tracks. The southbound platform already includes a cut (see photo at right) allowing it to be trimmed back to make room for a third passing track. Whatever the original intent of this configuration, the station will likely be entirely rebuilt when high speed rail comes through town. The Route 92 overpass (actually two side-by-side bridges, seen in the background of the photo) provides ample clearance for four tracks. The Hillsdale Caltrain station is already planned for relocation to the site of the former Bay Meadows station, and will be located between newly constructed grade separations at 28th and 31st avenues, connecting the west side of El Camino to the newly developed Bay Meadows area. The tracks will be elevated over 25th, 28th and 31st, linking up to the existing grade separation at Hillsdale Ave. These long-standing plans by the Caltrain JPB and the City are unlikely to be altered by the HSR project, except for quadruple tracking; for a detailed description, refer to Chapter 4 of San Mateo's Rail Corridor Plan. The resulting vertical profile is shown in the diagrams above. South of Hillsdale, the frontage along the east side of El Camino Real is already owned by Caltrain, Samtrans or Union Pacific; while businesses on that narrow strip of land will likely be displaced, plenty of land is available for expansion of the tracks. San Mateo promises to be one of the biggest design challenges on the peninsula. The CHSRA certainly has its work cut out for it, with a 50-foot right of way threaded through dense city blocks surrounded with residential neighborhoods, with a creek thrown in for good measure. NOTE: This post will be updated continuously, as warranted by additional information or new events relating to San Mateo.